Perennial. Zone 2. Asteraceae. (Syn. Compositae.) Widespread through Western North America. Common to wet coniferous forest and subalpine regions of B.C. A.k.a. Arctic Sweet Coltsfoot. Most Composites bloom late in the year, but the Colt’s Foot pushes its thick stem through the ground at the beginning of March, sometimes while snow still lingers. 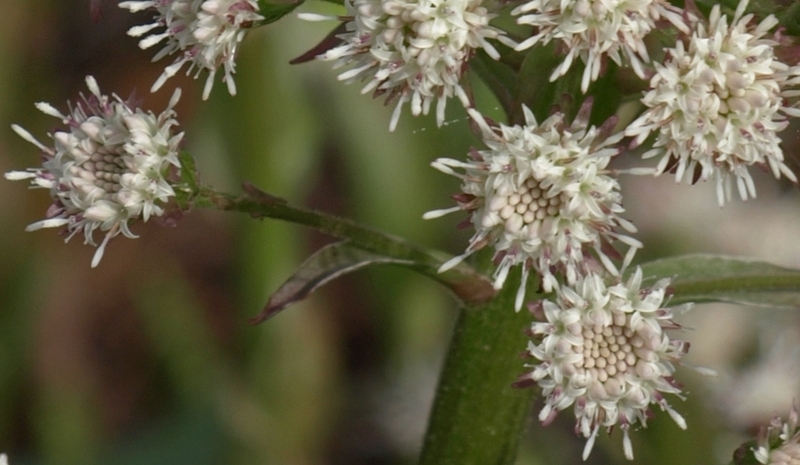 Soon the rapidly lengthening shoot displays a heavy, flattened cluster of purplish (sometimes white, rarely yellow) flower-heads. These are of two kinds, the staminate soon withering. The pistillate-heads usually have a few short ray-florets. By early summer they are succeeded by clusters of achenes whose radiating pappus recall a very large, but flattened, Dandelion “puff”. 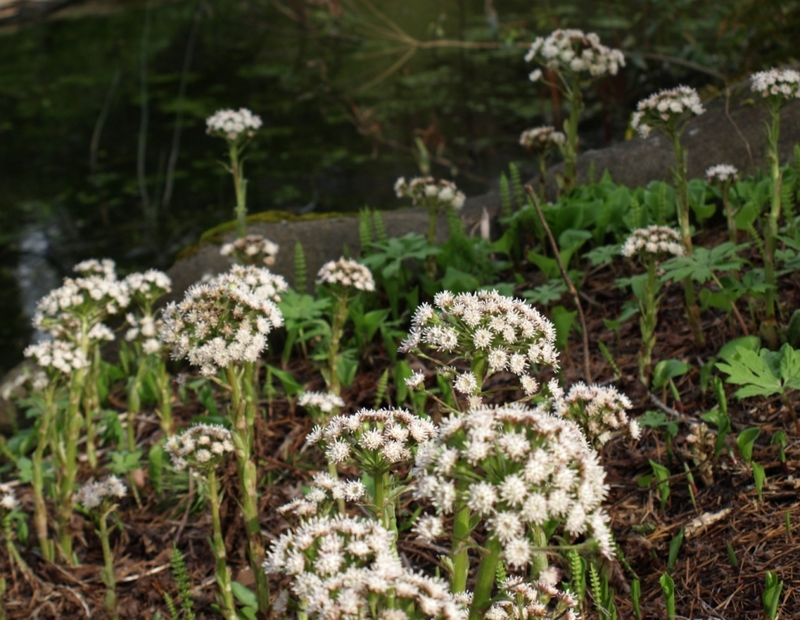 This species is very similar to Sweet Coltsfoot, Petasites frigidus var. nivalis, and as the ranges overlap, hybridization often occurs, making positive identification something of a challenge. 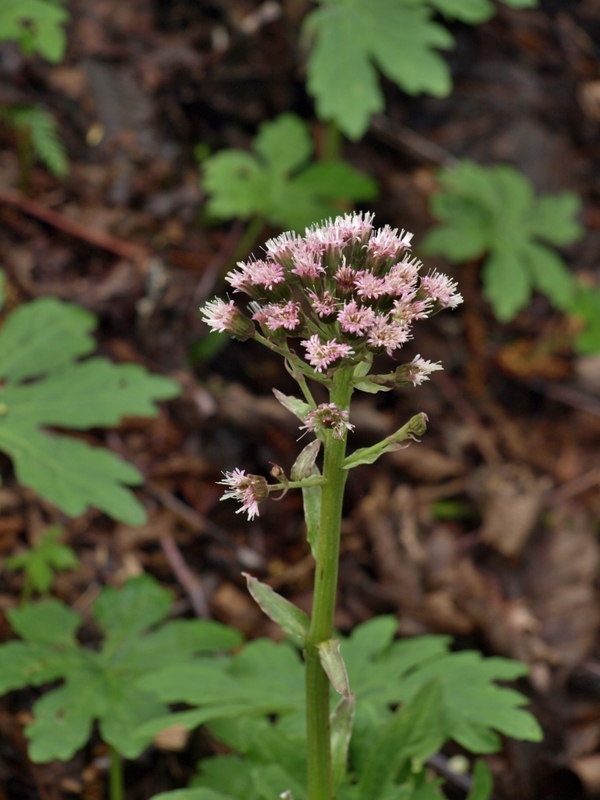 No matter what the details of nomenclature, the native Petasites found throughout the Cariboo are quietly spectacular in a low-growing, botanically interesting sort of way, being among the earliest bloomers and a sign of the start of the brief but intense growing season proper. 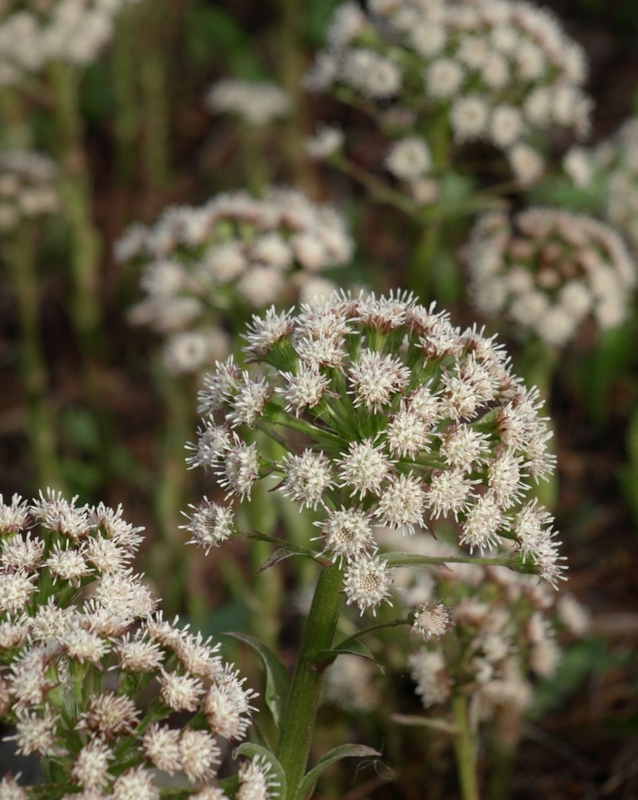 These plants happily grow in the garden, being most suited to moist wild gardens and boggy areas. They do spread vigorously where happy via underground rhizomes, so that is something to keep in mind when siting. Coltsfoot is reported to be attractive to early foraging bees and other pollinating insects. Ethnobotanical uses of Palmate Coltsfoot (and its relations) include flowering stalks and young leaves being used as an early “potherb”, no doubt highly welcome after a long winter of no fresh greens. 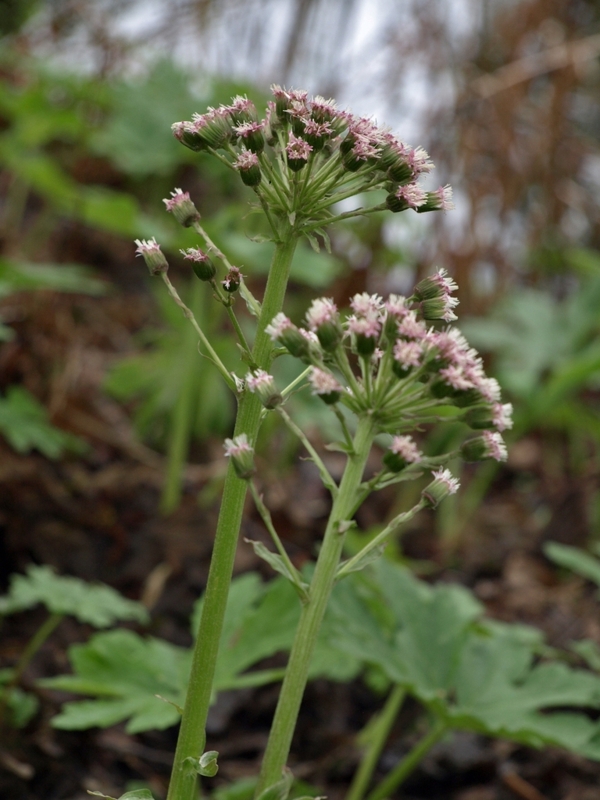 According to the field guide Plants of Northern British Columbia (MacKinnon, Pojar and Coupé, 1992), Petasites leaves were used to cover berries in steam-cooking pits. Medicinal uses were widespread, with decoctions used to treat chest and respiratory ailments, as well as externally applied to treat rheumatism. An interesting use which I have seen referred to in several places is the value of the plant as a salt substitute, either as an addition to stews, or from the ashes of the burned leaves. As with any medicinal or culinary use of plants, it is best to be cautious about consuming or applying anything one is not familiar with; the above uses are provided merely as historical notes and not recommendations or suggestions. 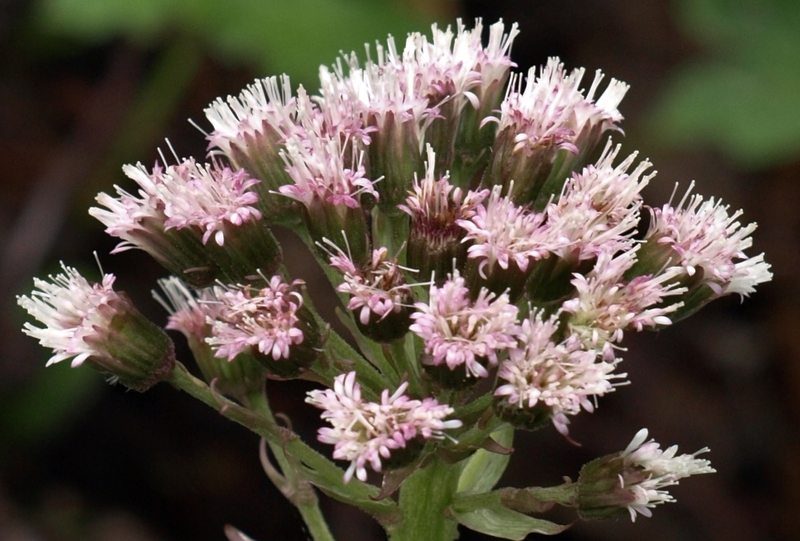 Petasites species contain alkaloids which may cause liver damage when ingested.